Here’s a thought to remember next time you think about sinking a burger and large fries: poor diets are one of the world’s biggest killers, shortening the lives of 1 in 5 people globally. That means diet is now deadlier than smoking. A huge new international study published in The Lancet has taken a thorough look at the different foods eaten across 195 countries and worked out the impact of poor diets on disease – specifically cancers, cardiovascular diseases, and diabetes – and death between 1990 and 2017. "While sodium, sugar, and fat have been the focus of policy debates over the past two decades, our assessment suggests the leading dietary risk factors are high intake of sodium, or low intake of healthy foods, such as whole grains, fruit, nuts and seeds, and vegetables," study author Dr Christopher Murray, Director of the Institute for Health Metrics and Evaluation at the University of Washington, said in a statement. In other words, what we're not eating is just as important to global health as the bad stuff we are consuming. 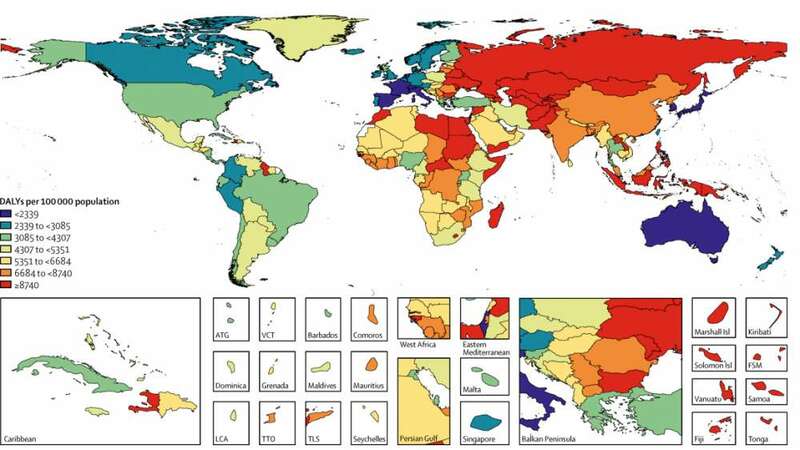 The countries with the highest rates of diet-related deaths, in order, were Uzbekistan (892 deaths per 100,000 people), Afghanistan, the Marshall Islands, Papua New Guinea, and Vanuatu. On the other end of the spectrum, the countries with the lowest rates of diet-related deaths were Israel (89 deaths per 100,000 people), France, Spain, Japan, and Andorra. The UK had the 23rd lowest number of diet-related deaths, while the US ranked 43rd lowest in the world. The study found that high-sodium diets, aka too much salt, were one of the leading culprits responsible for diet-related deaths, followed by a lack of whole grains and not enough fruit. A lack of nuts, vegetables, omega-3 from seafood, and fiber was also found to be associated with an increased risk of death. 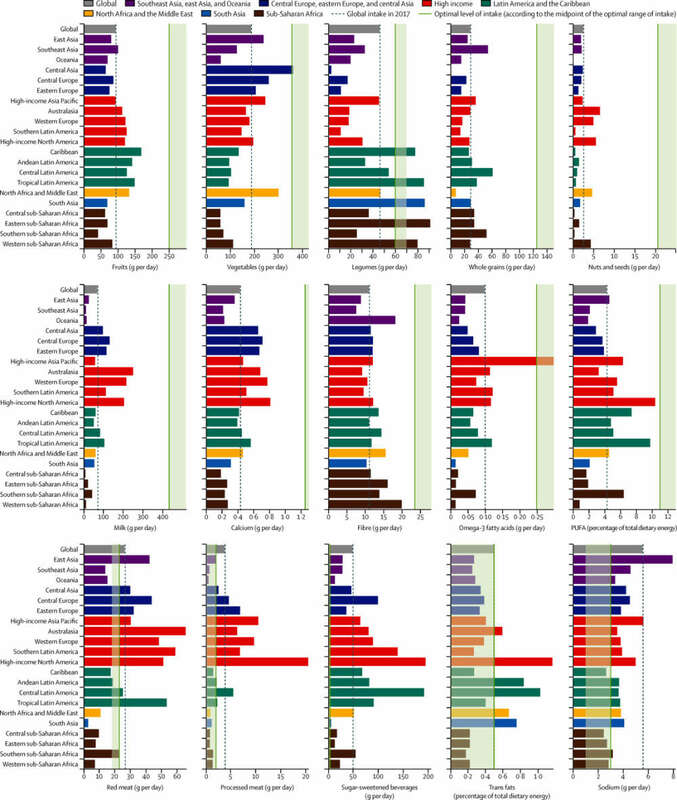 A low intake of whole grains was the leading dietary risk factor for death and disease in the US, India, Brazil, Pakistan, Nigeria, Russia, Egypt, Germany, Iran, and Turkey. For China, Japan, and Thailand, high sodium intake (above 3 grams per day) was the leading dietary risk. Every region of the world was shown to consume too much sodium with the exception of sub-Subaran Africa and the Caribbean. It’s also notable that Western Europe and the US lead the way when it comes to the consumption of red meat, processed meats, and sugary drinks – in other words, junk food. Although the research has been hailed as “high-quality” and "influential" by independent experts, others have argued the findings should be taken with a pinch of salt, so to speak. The study ignored many other factors that could account for a reduced risk of diseases, such as alcohol intake and exercise. “Most deaths from cardiovascular disease and cancer occur after the fifth decade of life and immortality is not an alternative – you have to die of something,” Tom Sanders, Professor Emeritus of Nutrition and Dietetics at King’s College London, who was not involved in the study, commented. “As death rates from infectious diseases fall, more survive to an age where they die from CVD [cardiovascular disease] or cancer,” he added.